There are two kinds of humility, as there are two kinds of pride. The first kind of pride is when a man reproaches his brother, condemns and reviles him as someone of no account, regarding himself as his superior. If such a man does not speedily come to his senses and try to mend his ways, he comes, little by little, to the second kind of pride, which puffs itself up in the face of God Himself and ascribes to itself its achievements and virtues, as though the man has done it all himself, with his own intelligence and knowledge, and not with the help of God. From this can be seen what constitutes the two kinds of humility. The first humility consists in considering that one’s brother has better judgment and is in all things superior to oneself — or in considering oneself below all men. The second humility consists in ascribing one’s achievements to God. This is the perfect humility of the saints. 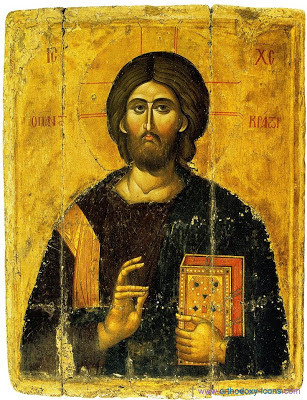 O sweetest Master, our Lord Jesus Christ, send Your holy grace and dissolve from me the bonds of sin. Enlighten the darkness of my soul that I might come to understand Your incomparable mercy, and love and thank You, as is right, my sweetest Savior, Who is worthy of every love and thanksgiving. Yes, me Good Benefactor, and greatly-compassionate Lord, do not take Your mercy from us, but have mercy on Your creation. I know, O Lord, the weight of my offenses, but I behold Your incomparable mercy. 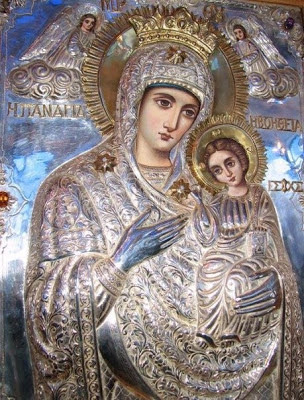 I perceive the darkness of my senseless soul, but I believe with firm hope, awaiting Your divine illumination and the transformation of my evil and sinful and terrible passions, through the intercessions of Your sweetest Mother, our Lady Theotokos, and all the Saints. Amen. "You teach soldiers to abandon pillaging..."
One soldier, who had great reverence to the Saint, was compelled to go to war. 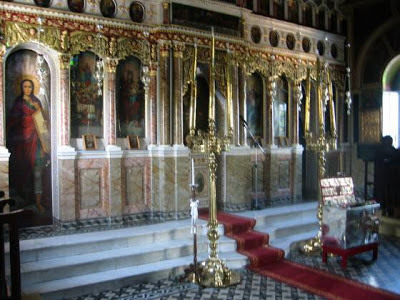 Before he left, however, he went and venerated the Saint, in the Church in which was the reliquary with the Precious Relic of St. Theodore. After the war, and following a great and radiant victory, when he returned, he went and again venerated the Saint at his Church. He left his sword, which was adorned with gold and precious stones, in thanks. Another soldier, however, went and venerated the Saint. He saw the beautiful and precious sword, and wanted to take it. He thought within himself: "The Saint doesn't need it. It is better that I have it, who am a soldier. 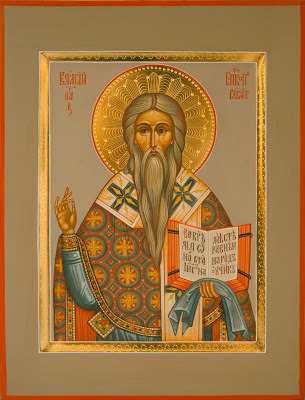 I would wield it in war with the blessing and help of the Saint." He therefore took the sword from the reliquary, put it on, venerated, and left with joy. Exiting from the Church, however, the Saint blinded him, and he could not see to walk. He therefore repented, and again returned the sword to the reliquary, and immediately received his sight. Seeing again the beautiful sword, and thinking that his blindness did not come from the Saint but from chance, he took up the sword again and left. As soon as he left the Church, however, again he was blinded. At that instant the priest of the church came and saw the blind soldier, asking him what happened. He related the details of what occurred. 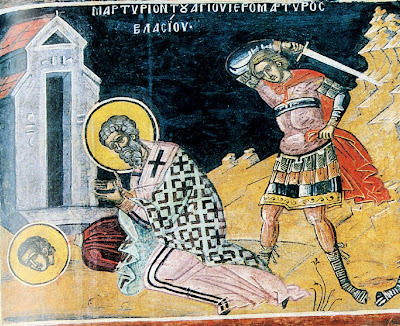 He entreated the priest to serve Paraklesis to the Saint to forgive him. He also gave him 100 gold coins as a donation. 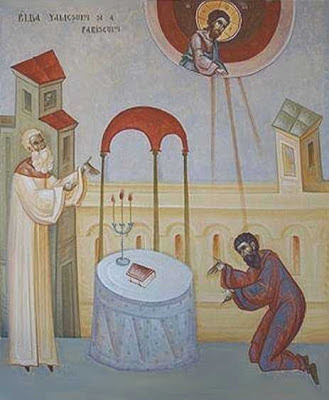 The priest then took oil from the vigil lamp of the Saint, anointed his eyes, and immediately he saw again. 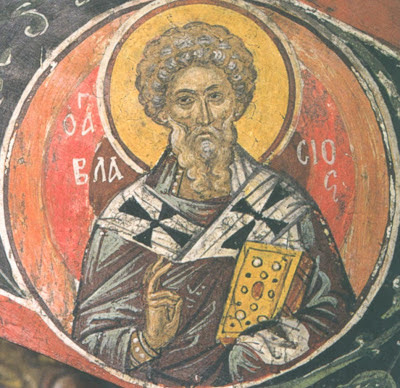 He fled with joy, glorifying God and St. Theodore. 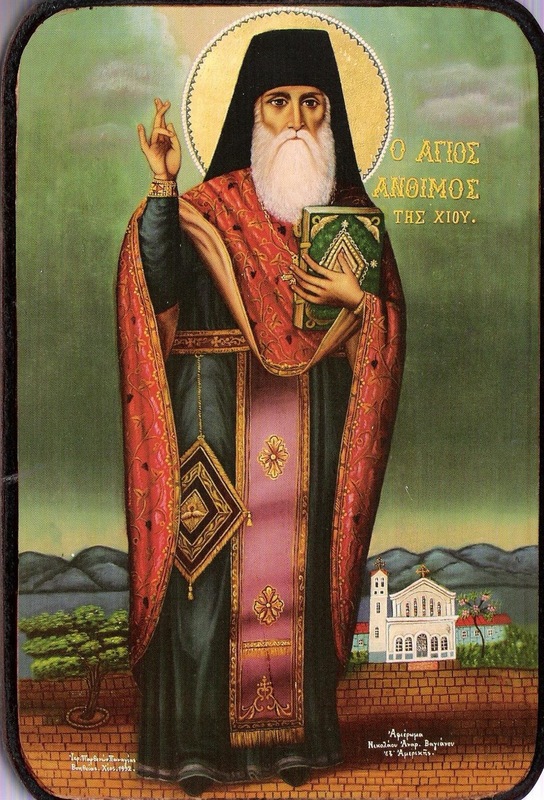 St. Anthimos, who in the world was known as Argyrios K. Vagianos, was born on July 1, 1869 to devout peasants, Konstantinos and Argyra, in Chios in the region of St. Luke Leivadion. He left elementary school early to become a shoe mender. 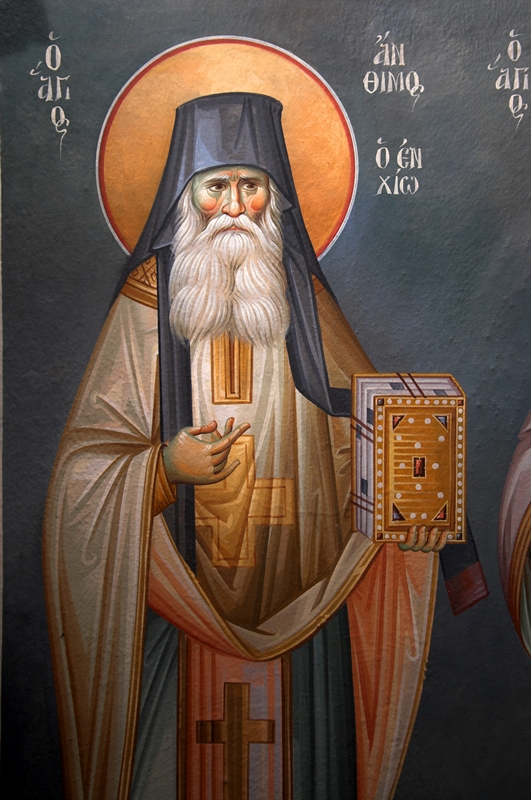 At the age of nineteen he visited the Skete of the Holy Fathers founded by the monk Pachomios, who had been the spiritual counselor of St Nektarios. 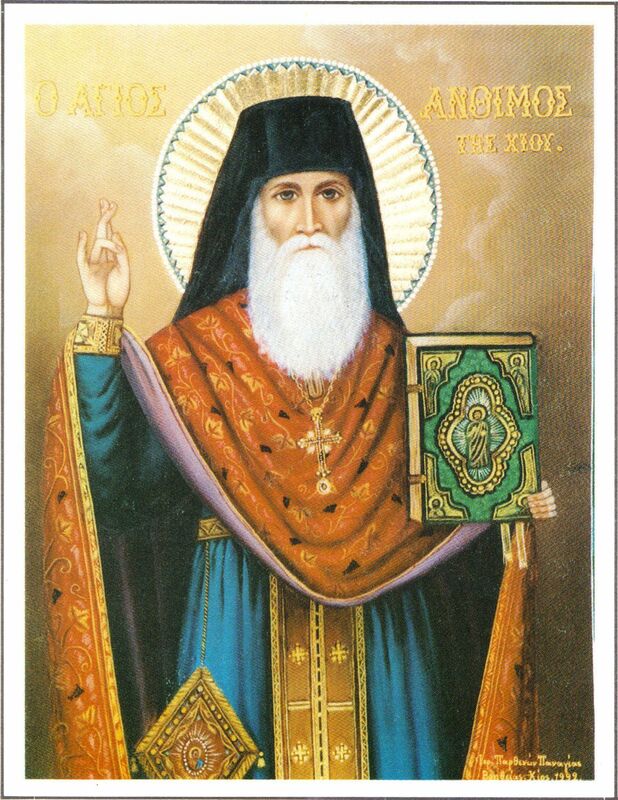 With the blessing of the elder, Anthimos returned home and built himself a small hut and dwelt in it. His only help in his spiritual contests was an icon of the Mother of God given to him by his mother later known as Panagia Voithia (the Helper), which soon began to work miracles, drawing many to his hermitage. He had returned home to relieve the suffering of his parents and help the poor of his village as well. After a time he retired to the Skete, and it was here that he became a monk and took the name Anthimos given by Elder Pachomios. He fell ill there and his abbot sent him home to his parents for the sake of his health. At home, despite the fact that he was caring for his aged parents and practicing his shoe mender's trade, he continued to live as a monk, spending nights on end in prayer and sometimes living only on bread and water for extended periods. He took his inspirtion reading about the lives of the great ascetics, and in this way he was able to conquer every assault of the devil. 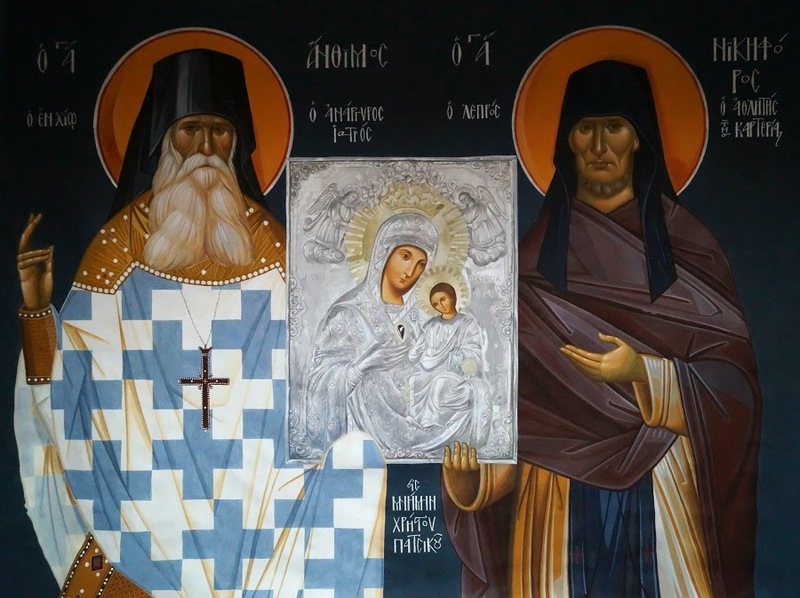 Increasing numbers of visitors came to his hermitage and wonder-working icon of the Theotokos, and in 1909, at the age of forty, he received the Great Schema by the successor of Pachomios, Hieromonk Andronikos. The people of Chios wanted him to be ordained to the priesthood, but his bishop refused due to the Saint's lack of education. 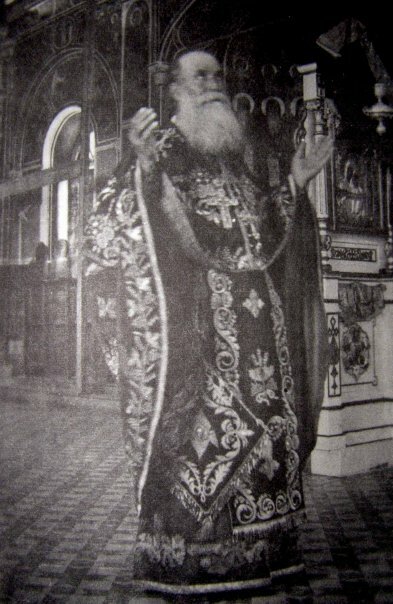 At the prompting of Anthimos' godfather, the Bishop of Smyrna ordained him instead in 1910. 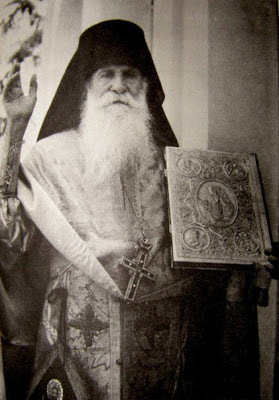 After a pilgrimage to Mt Athos in 1911, he returned to Chios, where he became chaplain to a leper hospital. Soon the hospital, which had fallen into corruption, became a spiritual center, as much like a monastery as a hospital. 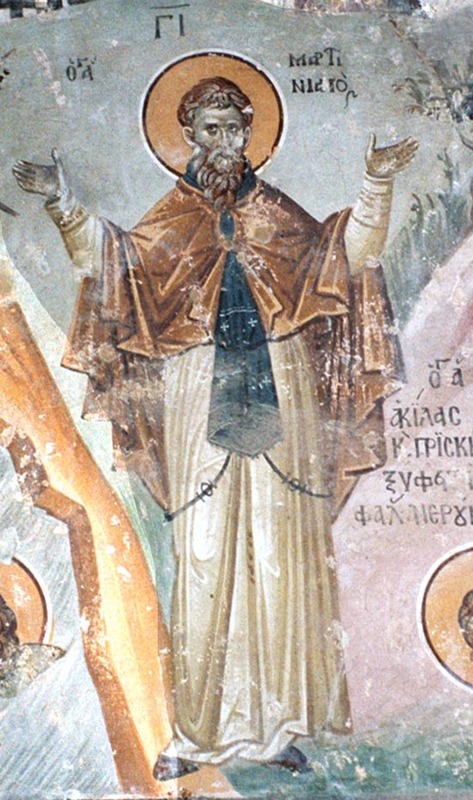 Saint Anthimos tended many of the sickest with his own hands, working many miracles of healing; some of his recovered patients became monks or nuns (such as Righteous Nikephoros the Blind). With the notorious 'Exchange of Populations' of 1922-1924, refugees poured into Chios, many of them destitute nuns and girls. In response to a vision of the Mother of God, St Anthimos built a monastery in 1930, which opened with thirty nuns and grew rapidly, despite the opposition of many who said that setting up such a community was out of date. The Monastery of Panagia Voithia, as it came to be known, soon housed eighty nuns and was known througout Greece as a model of monastic life. Father Anthimos served as priest to the nuns, and continued to receive the many faithful — often sixty or seventy per day — who came to him for prayer or counsel. He carried on this ministry for more than thirty years, working many miracles of healing. When he was too old to work with his hands, he retired to his cell and prayed that he be enabled to serve his neighbor until his last breath. "The other holy personality that I had the blessing to meet was another Saint of Chios, Saint Symeon, the abbot of Psaron. 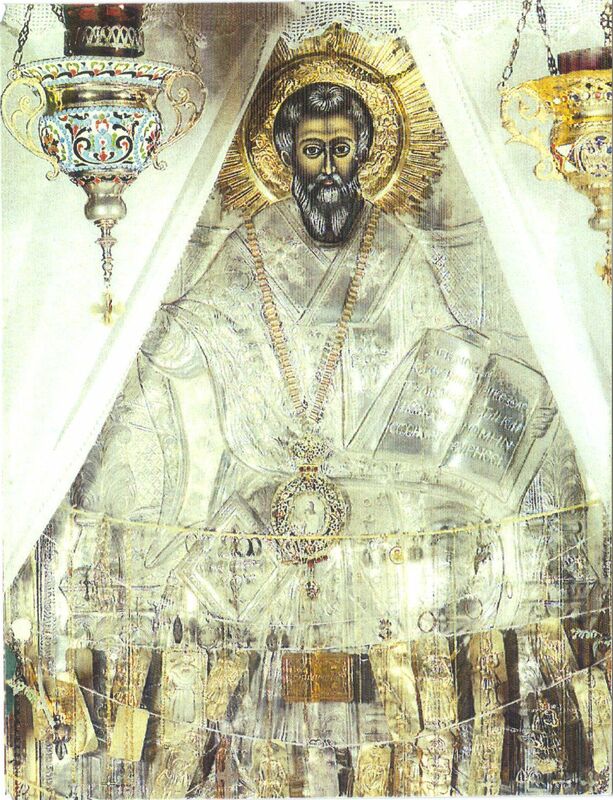 From the age of 8 I would go to the Monastery and learn letters studying the Psalms of David! I remember he was a strogly built man and upkept the monastery buildings with much love. At night they would hear him go to a gorge next to the Monastery and break stones, in order to, as he would say, tame himself through work and for the devil to not battle against him. In the morning he would be prompt for Services. I was blessed, from the age of five, to be near him" (ΑΠΟΣΤΟΛΗ, num. 55, Winter 2003-04). A Miracle of St. Anthimos is related here. - “What do people do when their hands and faces are dirty? They turn on a tap and allow the water to clean away the stains. We should imitate them. Only, we should open two taps – our eyes, so that an abundance of tears of repentance pour out, which will wash out all the poisons of this futile world which have infected and dirtied our wretched souls”. - "The Panagia is the only mother of all Christians. And who does not call upon her. Because the sufferings of mankind are many in this vain world, nowhere else can we all find relief, except in the Panagia. When you are sitting there quietly, a thought suddenly comes to you and brings darkness. Where will you go to be loosed from this darkness? To the Panagia. 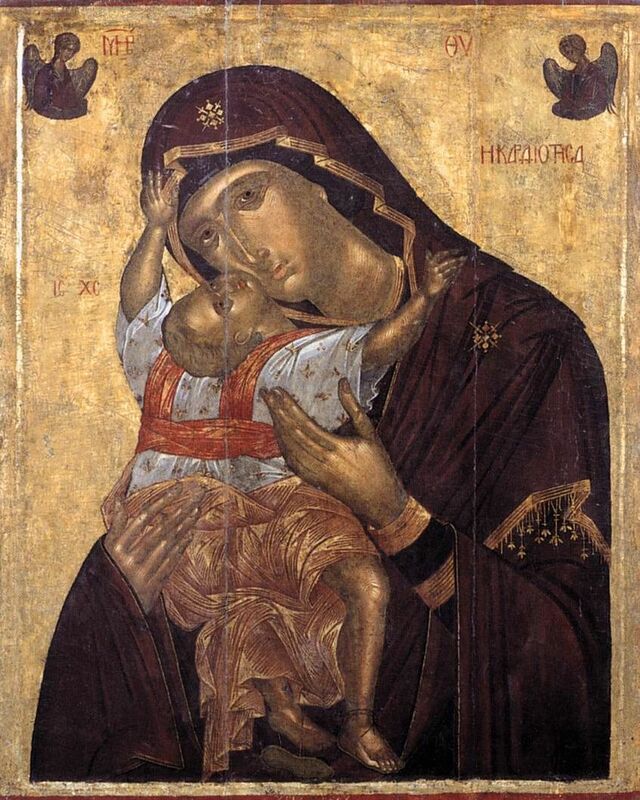 All the Saints are our helpers, but above all is the Panagia. "She has the riches of great compassion. She has great love for mankind, especially for sinners. For this reason she never ceases to mediate to her Son, and the Son takes great joy when His mother intercededs on behalf of mankind. For this reason she brought us His mother and granted her to us that we may have her as a source of salvation." 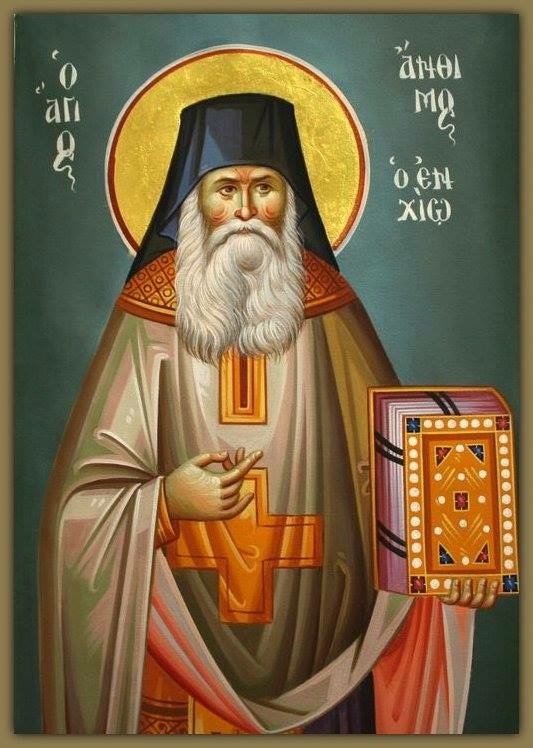 O new boast of Orthodoxy, and newly-adorned flower of purity, you shared the name of Anthimos of Nikomedia, and shared his virtues and way of life, O new seal and adornment of the venerable, O Father Anthimos, the boast of all Chios, entreat Christ God to grant us the great mercy. When morning came, St Martinian came out to send the woman away. Though he was tempted by the woman's beauty, he was determined not to fall into sin. Lighting a fire, he stepped into it, saying, "You want me to burn with temptation, and want to lead me into the fires of Hell. I will not let you. Instead, I will burn for my virginity and save my soul." The woman came to see how evil she was. She repented and asked the saint to guide her onto the way of salvation. He told her to go to Bethlehem, to St Paula (January 26). There she lived as a nun for twelve years in strict asceticism until her blessed end. The woman's name was Zoe. Once a powerful storm wrecked a ship, and a woman named Photina floated on pieces of the wreckage to the island of St Martinian. 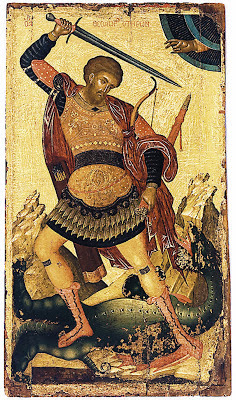 St Martinian helped her to survive the island. "Remain here," he told her, "for here is bread and water, and in two months a boat will come." 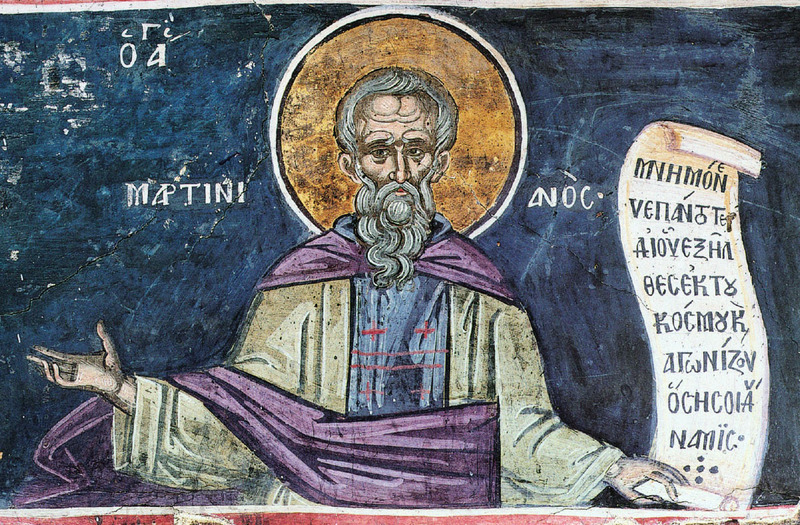 You quenched the flames of passion, blessed Martinian, with abundant tears; you calmed the waves of the sea and checked the assaults of wild beasts, saying:"Almighty God, You are most glorious, for You have saved me from the fire and storm!" 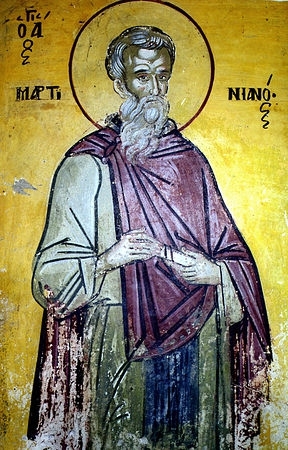 Let us worthily praise with hymns the ever-venerable Martinian, the tried ascetic who struggled for piety, an honorable athlete by deliberate choice, and a resolute citizen and inhabitant of the desert; for he has trampled down the serpent. Along the way the saint healed the sick and worked other miracles. Thus, a destitute widow complained to him of her misfortune. A wolf had carried off a small pig, her only possession. The bishop smiled and said to her, "Do not weep, your pig will be returned to you..." To the astonishment of everyone, the wolf came running back and returned his prey unharmed. Addressing the pagans standing about on shore, he challenged them to come to him while calling on the help of their gods. Sixty-eight men of the governor's retinue entered the water, and immediately drowned. 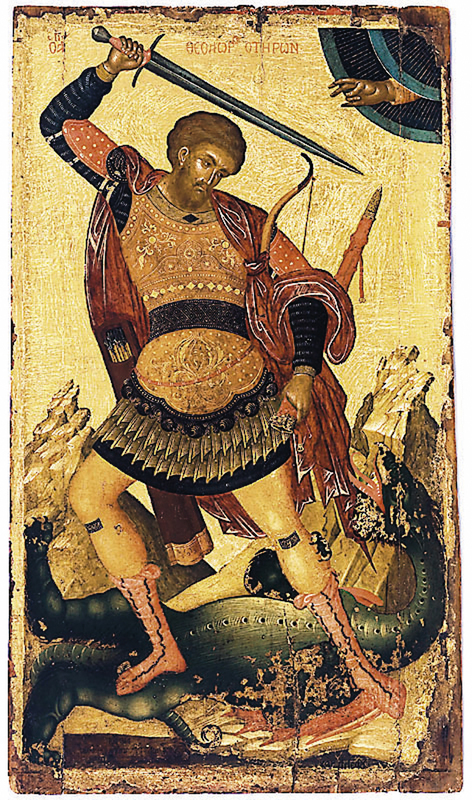 The saint, however, heeding the angel who had appeared to him, returned to shore. By sharing in the ways of the Apostles,you became you became a successor to their throne. 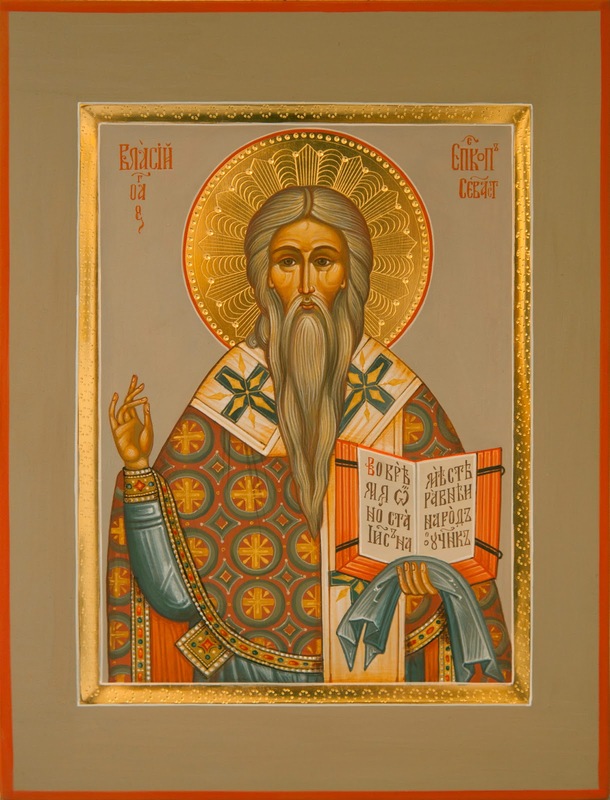 Through the practice of virtue, you found the way to divine contemplation, O inspired one of God; by teaching the word of truth without error, you defended the Faith, even to the shedding of your blood. 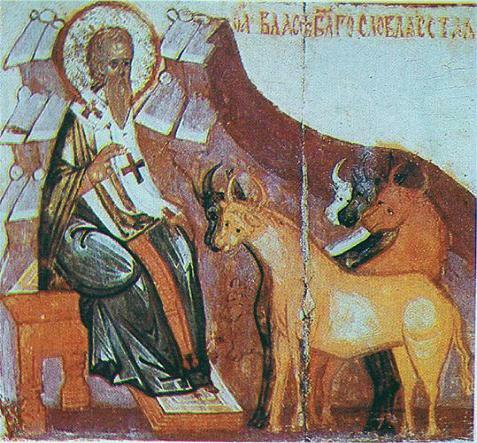 Hieromartyr Blaise, entreat Christ God to save our souls. Godly shoot, unfading flower, most fruitful branch of Christ the Vine, God-bearing Blaise, fill with joy those who in faith honor your memory as you unceasingly intercede for us all. 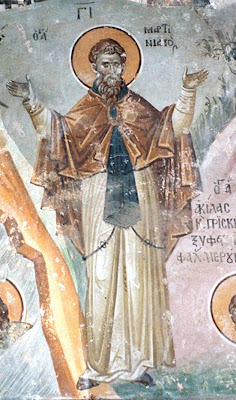 Emperor Nicephorus (Botaniates) of Constantinople reigned from 1078 until 1081. He had decided to build a cathedral that would be almost as grand as St. Sophia. When it was ready, the patriarch of Jerusalem, the patriarch of Alexandria as well as the patriarch of Constantinople were all invited to consecrate the beautiful new church built by the emperor. Announcements had been made about the consecration for several months in advance so that everyone would have time to travel to the great city of Constantinople; remember that during that time there were no cars, planes or trains. Everyone had to travel either in carts pulled by oxen, horses or donkeys, and those from great distances had to cross the sea in boats. Still, she was afraid because she did not own land, so where would she get the grass without doing something wrong? - I will give the oxen some grass, even if it is not from my own land. - Lord, accept this bit of grass, and forgive me, for I have nothing to bring to the church consecration, and even this is not from my own land! 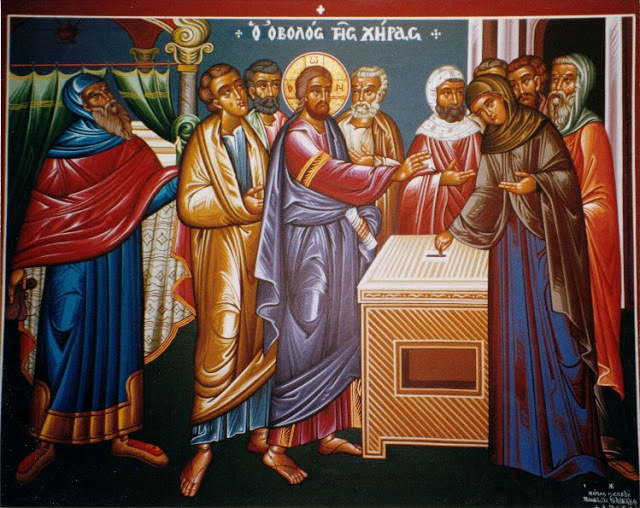 - Lord, forgive me, for I have not brought any kind of offering for the church! I have nothing. The emperor is a king on earth and will be great in heaven, but I am so poor and have no money, nothing to offer. And as she prayed, her tears dropped to the ground. Then Emperor Nicephorus, with all his entourage and servants, came into the church. His chief minister, Peter was his name, pointed to the dedication plaque—since in churches and monasteries that are historical monuments there are dedication plaques over the doors—and drew the emperor’s attention to it. 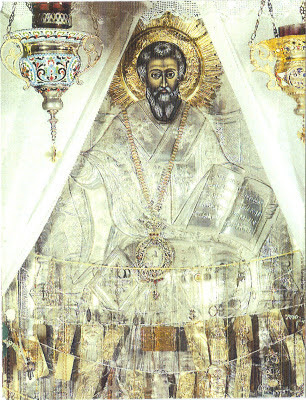 The plaque was made of marble and the golden inscription read “To the glory of the all holy Trinity of the Father and of the Son and of the Holy Spirit, this holy church was built and provided for by me, the Emperor Nicephorus.” The emperor fully approved of the way the inscription had been executed, since he was the one who had ordered it. - What! What does that say? - Look, it says that a widow built this church! - But just a moment ago when the emperor came in, it had his name on it. - What will the emperor say when he sees this? - But this is a miracle! It’s all right. I will tell the emperor! - Your Majesty, come into the vestibule a moment. - But, when we came into the church, it was my inscription. - I know that it was yours, Your Majesty. Everyone knows it was yours. But look at what is written there now! - Oh! What a sinner I am! This is a great miracle! No one could have done this except God Himself! This is a wonderful miracle. I lost the church because I made it in my own pride. Now it has been given to a widow! The emperor then called all his chief servants and told them,—This church is not to be consecrated until we find this widow! Once she is found, we will do the consecration in her name because she is greater before God than I am. Then he gave the order to search throughout his entire empire for the widow Anastasia. - I know Anastasia. She lives at the edge of town. - What! You know her! Come here to the emperor! - Do you children know where an old woman by the name of Anastasia lives? - Anastasia lives over there, near the garden. - The old woman, Anastasia, is not home. - No. Anastasia left with an armful of grass to the farm market, the children answered, not knowing that she had gone to the church. - Your Majesty, we went and found the small house on the edge of town. There were some children playing and they said that Anastasia is here, in this crowd, somewhere. - She is praying to the Savior! - If she is in church, tell her not to be afraid, since she has never met me, said the emperor. Send some elderly women to her to tell her that at the consecration of the church the emperor is going to make a gift of a cow to all the old women. - I did not bring anything, Your Majesty, because I am so poor! She did not consider the armful of grass that she’d given the oxen as any kind of offering. - I didn’t bring any gift because I have no money. I have nothing! All I have is a sickle and a pitchfork. During the winter I spin wool for people, and in the summer I use the sickle to glean after the harvesters. I manage to get a little wheat from what I glean. Aside from that, I have nothing. - This is an imperial church and I spent a fortune from my own gold and silver to build it; but look at the inscription that says it was made by Anastasia! What did you give to this church? - I didn’t give anything except for an armful of grass to a yoke of oxen. - Don’t be afraid, Anastasia. The inscription was done by God, not you. God Himself wrote that this church is yours! - You see, dear woman, you say that you did not bring any thing, but remember that you did bring an armful of grass! - I did bring that, but it was not a real offering from me since I cut it from someone else’s field. - Look, Anastasia, your armful of grass was more precious than all the treasures that I gave. See, the angel of the Lord has put the church in your name and it will remain yours forever. We will consecrate the church with all these patriarchs, with all the pomp and celebration as we planned, but the church will be Anastasia’s forever. The church will be consecrated with your name since the angel has written that both in heaven and here. 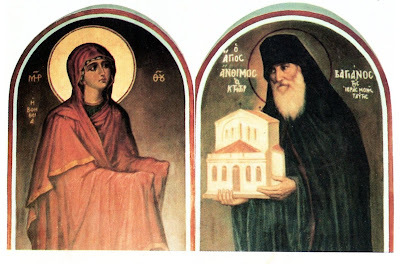 When the blessed Anastasia from Constantinople died, the emperor buried her in the holy altar, with an inscription above her tomb, Here, in the church that God miraculously gave her, is buried the widow Anastasia. To speak of love is to dare to speak of God, for, according to St John the Theologian, ‘God is love, and he who dwells in love dwells in God’ [1 Jn 4.16]. And the astonishing thing is that this chief of all the virtues is a natural virtue. Thus, in the Law, it is given pride of place: ‘You shall love the Lord your God with all your heart, and with all your soul, and with all your might’ [Deut 6.5]. When I heard the words ‘with all your soul’ I was astounded, and no longer needed to hear the rest. For ‘with all your soul’ means with the intelligent, incensive and desiring powers of the soul, because it is of those three powers that the soul is composed. Thus the intellect should think at all times about divine matters, while desire should long constantly and entirely, as the Law says, for God alone and never for anything else; and the incensive power should actively oppose only what obstructs this longing, and nothing else. 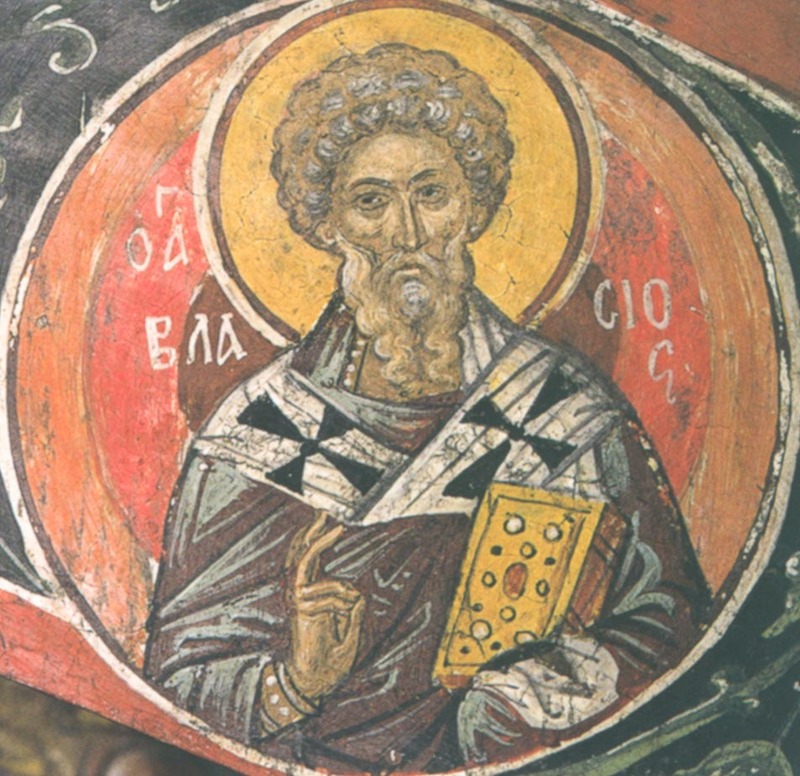 St John, consequently, was right in saying that God is love. If God sees that, as He commanded, these three powers of the soul aspire to Him alone, then, since He is good, He will necessarily not only love that soul, but through the inspiration of the Spirit will dwell and move within it [cf 2Cor 6.16; Lev 26.12]; and the body, though reluctant and unwilling–for it lacks intelligence–will end by submitting to the intelligence, while the flesh will no longer rise in protest against the Spirit, as St Paul puts it [cf Gal 5.17]. Just as the sun and moon, at the command of God, travel through the heavens in order to light the world, even though they are soul-less, so the body, at the behest of the soul, will perform works of light. As the sun journeys each day from east to west, thus making one day, while when it disappears night comes, so each virture that a man practices illumines the soul, and when it disappears passion and darkness come until he again acquires that virtue, and light in this way returns to him. As the sun rises in the furthest east and slowly shifts its rays until it reaches the other extreme, thus forming time, so a man slowly grows from the moment he first begins to practice the virtues until he attains the state of dispassion. And just as the moon waxes and wanes every month, so with respect to each particular virtue a man waxes and wanes daily, until this virtue becomes established in him. 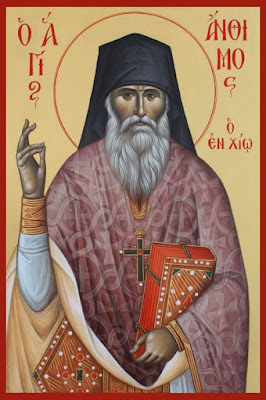 At times, in accordance with God’s will, he is afflicted, at times he rejoices and gives thanks to God, unworthy as he is to acquire the virtues; and sometimes he is illumined, sometimes filled with darkness, until his course is finished. All this happens to him by God’s providence: some things are sent to keep him from self-elation, and others to keep him from despair. Just as in this present age the sun creates the solstices and the moon waxes and wanes, whereas in the age to come there will always be light for the righteous and darkness for those who, like me, alas, are sinners, so, before the attainment of perfect love and of vision in God, the soul in the present world has its solstices, and the intellect experiences darkness as well as virtue and spiritual knowledge, and this continues until, through the acquisition of that perfect love to which all our effort is directed, we are found worthy of performing the works that pertain to the world to be. For it is for love’s sake that he who is in a state of obedience obeys what is commanded; and it is for love’s sake that he who is rich and free sheds his possessions and becomes a servant, surrendering both what he has and himself to whoever wishes to possess them. He who fasts likewise does so for love’s sake, so that others may eat what he would otherwise have eaten. In short, every work rightly done is done out of love for God or for one’s neighbor. The things we have spoken of, and others like them, are done out of love for one’s neighbor, while vigils, psalmody and the like are done out of love for God. To Him be glory, honour and dominion through all the ages. Amen. “Behold, I and the children God has given me”. I didn’t want to have children in the world by the flesh and God gave me you to have as my spiritual children. That saying comforts me and I imagine it brings you joy, too. I’ve got you as my children and you think of me as your spiritual father. The spiritual father is superior to the father after the flesh. Because if I see you dashing your foot against a rock, I’ll be worried; I’ll run and help. If I see you being dragged to court over some debt that you owe, I hurry along and pay it on your behalf. If I see people condemning you, swearing at you or slandering you, I’ll hasten to take your side and defend you. If I see you’re sad and you’ve got no consolation anywhere, I’ll try my best to let a drop of my blood drip on you, if possible, to comfort you. If I see that you’re ill, I can’t help but provide you with some sort of assistance towards your treatment. Because my soul’s in pain; I can’t see you in need and be indifferent. Because I was given you by the Holy Spirit and I feel for you. If you’re under the sway of some demon, if you’re in danger from the passions, if you’re troubled by one thing or another, I can’t rest. I try with all means possible to relieve you of that. I even give you remission of sins, so that you can go to heaven shriven. But everything depends on you. Everything we’ve spoken about now, I’m willing to give you. You’ve known that for many years and you see it every day. But it depends on your own faith and reverence. It rests on the devotion and fervour you have towards me. You have to have the proportionate feelings towards me, to apply what is appropriate to your position, if I’m to supervise you and to act as your shepherd. Because it appears I’m an unworthy shepherd. I’m not worthy, I know, but I’m the one who’s here. But a shepherd’s always wary. When he sees a wolf coming, he not only attempts to guard his sheep with all available means, but he also calls on others to help. The shepherd shouts, whistles, throws stones at the animals, which are incapable of reasoning. I do the same, sisters: at time times I shout, at others I berate you, and then again I get angry. Because I’m the shepherd of sheep who have the power to reason. But there shouldn’t be any need to be like that. Because the unreasoning animals have no reason. They don’t understand. But for those who have reason, one word from the shepherd and they should listen. But since, maybe because of interference from the demons, from bad habit, or disregard for the shepherd, they don’t listen with just one word, then everything that we’ve talked about has to be applied. Merely the written word, the word of the Gospel is enough to teach a human flock and for me to protect it from that surreptitious wolf, the devil. But since we don’t listen to the word, I am unfortunate enough to have to fight, sometimes with shouting, sometimes with penances, at other times with comfort, all the time watching over you to see you don’t overstep your bounds. Don’t be troubled, sisters, over what I’m telling you, but rather engrave it deeply in your hearts, because one day I’ll leave and you’ll need it. It’s my love that moves me to say these things to you. There’s this spiritual affection which I can’t express to you other than through what I’m telling you. You have to listen to me. These paltry words of mine are my testament and you must guard them. I didn’t come here to lie down on soft mattresses and rest to my heart’s content; I came to fall into humility. I didn’t come here for glory and honour and for you to call me “Sir”; I came to be cursed, to be hungry, thirsty, to labour, to toil to be mocked, to be trampled upon for the love of Christ. I’m no “Sir”. The Mother of God and her Son are the Lady and Lord. I’m your servant. I’ve served you so many years. I’m a slave of yours; I don’t even want to be called “Elder”. I don’t like and I don’t want it but it’s to your own credit that you honour me so.